Today I miss my adoptive mom. Yeah, that’s the truth. As much as she wasn’t there for me, as much as she was the most repressed person on the planet, as much as she chose to ignore the signs of my abuse or bury it once she knew, I still don’t blame her: she had her own problems. Little glimpses of a time when she was carefree would reveal themselves occasionally. Little glimpses of a real person. She could smile once in awhile. Those times were enough. They were rare, but when they were there, they glimmered like a jewel. In reality, I just don’t like blame. I know you probably think that’s crazy, since I have an entire website devoted to blaming Holt for the complicated thing that is my life and thousands upon thousands of other Korean adoptees’ lives. I don’t blame Holt for the horrors of the past. I don’t blame Holt for the mistakes they made then. I blame them for the willful disregard for human beings they continue to commit today, with full knowledge of the mistakes of the past. Yesterday a friend who has spent the last TWO YEARS trying to get her adoption records from Holt, but instead only received documents piece-meal, each time being told they had given her everything, each time the documents not quite adding up to the data she already had. She finally received – only through her own dogged persistence and the encouragement from us and the help of KCARE – her full adoption records, which included ELEVEN more documents than the last time Holt had told her they had given her everything. ELEVEN. That’s a lot of documents to over-look so many times. I guess everything has a different meaning to Holt. And this friend’s parents are dead. Nobody’s privacy to protect. No excuses they could possibly make to this adoptee are good enough. Get yourself over to Conducive Magazine’s Blog, Conducive Chronicle and read some great blogs in honor of November, which is ADOPTION MONTH. Here’s one of my favorite heroine’s submissions…might have to add something myself this week. November is National Adoption Month. What would such a celebration of adoption, whether in the U.S. or another country, mean to my Korean birthmother? At the time my mother became a “birthmother,” I was six months old, and my sister was four years old. Because she passed away about nine years ago, I will take the liberty of imagining what she might say about the meaning of adoption in her life, if she could read other people’s blogs in English, and if she could blog back. I did not give birth to my child “with my heart.” I gave birth to my child with my body – painful, and tearing. I was desperate and without the means to earn enough money myself. I and my children were victims of domestic violence. There was nowhere for us to go. No one would help us. We were so alone. I had no other choice but to relinquish my children. But my children did not feel relinquished. They felt abandoned. I am so, so sorry. As a woman in a profoundly patriarchal society, I was not allowed to divorce a man who hurt me. I did not have strong custody rights over my own children. Laws did not protect me or my daughters. I was so desperate that I signed away my baby for international adoption the day I brought her to the orphanage. I signed her away with my red-inked thumbprint because I had no stamp. I didn’t know what international adoption meant. I thought my daughters would just live well in another country and be raised in privilege, send pictures and letters, and then come back to me, their mother. The noise of the airplane taking off tore my heart. The church gave me eggs, and pencils. When I met my older daughter again, so many years later, I pressed her face to my breast to show her that I made her with my own body. That I indulged her, allowing her to nurse for years, as long as she wanted. How much I loved her. How much I wanted to show her that. But I only frightened and repulsed her. I prepared her favorite food and she did not remember it. I took her to the old places where she used to play, and she did not remember them. I spoke to her in the language she spoke as a child, and she could not understand me. I called her by her name and she did not recognize herself. Is this our Father’s plan? What have I gotten from this? I am not a whore, not a saint, not a storybook character. I am a real mother. My name is Lee Pil-rye. My children were never orphans. This is what adoption means to me. 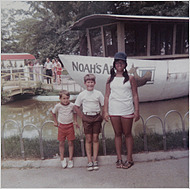 Lee Pil-rye’s daughter, Jane Jeong Trenka, was sent for international adoption to Minnesota in 1972, and returned to live in Korea in 2004. She is the author of Fugitive Visions and The Language of Blood, and co-editor of Outsiders Within: Writing on Transracial Adoption. She is president of TRACK (Truth and Reconciliation for the Adoption Community of Korea).